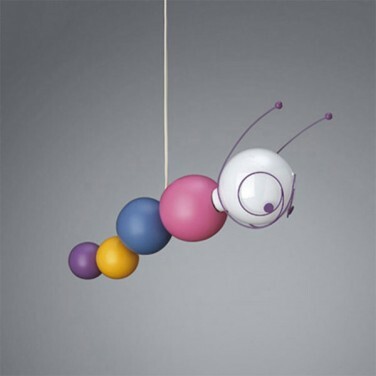 Illuminate your child's room with the cheeky faced Ruby Caterpillar Ceiling Light. Fun children's lighting, Ruby's bright and cheerful personality lifts their room with it's charm and soft glow. A stunning, high quality children's pendant light the Ruby Caterpillar Ceiling Light brings it's own charm and personality to your child's room. Make the dark a friendly place with the fun and cheerful caterpillar in bright and vibrant colours. Your child will love to turn on the light as the large eighteen Watt low energy globe bulb is actually Ruby's cheerful, smiling face! Perfect quirky lighting for a child's room or nursery, Ruby comes on a 125cm long cord that can be adjusted depending upon your ceiling height.